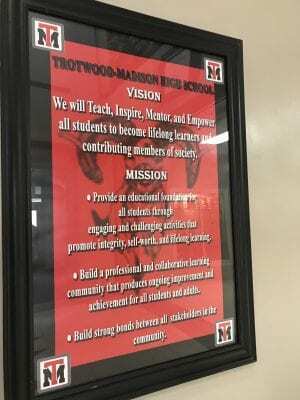 Trotwood’s mission statement. Not that I love mission statements on the walls. I left a school board meeting last night and didn’t feel dirty. That’s the total opposite of every visit I make to the cesspool that doubles as the Dayton Board of Education. Trotwood schools are currently 608 out of 608 districts in the state. Dead last. Bottom of the barrel, but going to a school board meeting run by competent, intelligent, caring, well adjusted folks is a joy. Yesterday was a work session. The board president opened the meeting and immediately spelled out what kind of meeting it was, how many meetings they have, the purpose of the meeting and thanked the audience for being there. There was a constant flow of information, with the goal of transparency and purpose. They are committed to “608 to great” but I’m pretty sure that by mid-September they will be well above 608 which will now be owned exclusively by the folks on Ludlow- who deserve it. The primary purpose of the meeting was to onboard new staff. Much like the supposed purpose of DPS’s Monday Maelstrom meeting where the board engaged in additional board business that could only be viewed as an end-run around public scrutiny. New acting Superintendent Tyrone Olverson had a 16 page booklet printed with brief bios of every new hire. They were invited on stage to be welcomed by him and the board. Their academic backgrounds were highlighted. It was a celebration of hiring. Sort of like when your sports team gets first pick in the draft and gets LeBron James. Compared to Dayton, where hiring seems more like a revolving door function. I’ve been in Trotwood’s High School before, but never in the auditorium. It’s not yet the ideal place to have a board meeting, but there is hope with a few adjustments to lighting, seating arrangement and better tech. But, I’ve been in every DPS high school, and the only one that compares is Stivers- a building that wasn’t built or the reconstruction managed by DPS folks. Trotwood felt like a school. DPS buildings, for the most part, feel like they were designed as baby prisons, which makes total sense as they are a first stop on the school to prison pipeline. It’s easy to see why so many quality former DPS staff are now happily working in Trotwood. The board president came over to talk to me, thanking me (and my video camera) for being there. She was ebullient and epitome of professionalism. We discussed the meeting and she shared that all board members have to read 12 books a year. I asked her if she was familiar with the Dolly Parton Imagination Learning Library program and she immediately understood the value proposition and the problem it addressed, and wanted me to send a link and handed me her professional district card. The board acknowledged the public officials in the audience- including County Commissioner Dan Foley, County Auditor Karl Keith and the vice Mayor of Trotwood. I can’t remember seeing that many public officials at a DPS shitshow unless they were invited. I can’t remember when the Dayton Board of Education has listened to anyone, other than paid consultants who take the money and run as just another run through the chaos generator that is DPS. Speaking of which, there has been an outpouring of frustration with yet another one of Dr. Lolli’s overpriced hires- who apparently has decided to ignore the work of her competent predecessor and has told everyone that she’s starting her operation from scratch. More will be coming as I gather the rest of the stories. What have you been focusing on Dr. Lolli?